For businesses: Grow website traffic, sales, and improve SEO rankings, all without writing a single ad. For publishers: Make money from editorial content without ads. 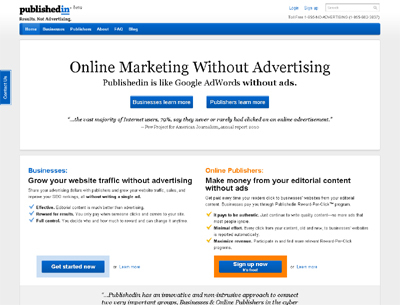 Publishedin allows businesses to share their advertising dollars with publishers and grow website traffic, sales, and improve SEO rankings, all without writing a single ad. With Publishedin Reward-Per-Click program, businesses reward publishers when people click to their website. It is like Google AdWords without the ads. Publishedin is an innovative online marketing solution for any website owner and any type of business.